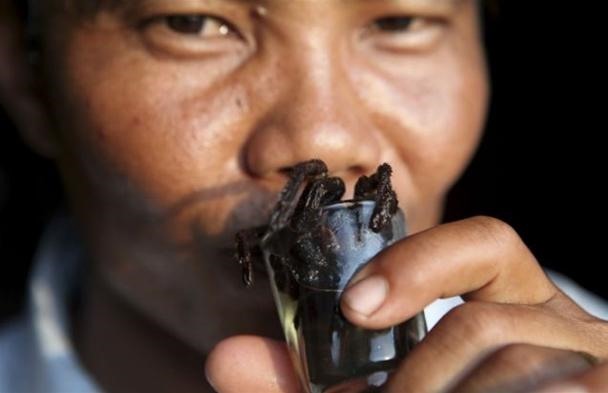 "The arachnophobe's nightmare is made using rice wine, jack fruit and a tarantula – which many Cambodians believe can help your heart and work as an aphrodisiac. Photographer Tim Whitby, who took the pictures, said the tarantulas are added live to the mixture to preserve their freshness. They are also fried and sold at roadside kiosks." Previously, Slurp Live Octopus Here. 101 Ice Cream Flavors That'll Make You Hurl. Um, Yum? HowTo: Cook Testicles. As if I wasnt creeped out by spiders enough.